RIO DE JANEIRO, BRAZIL – Nestled between Santa Teresa and Cinelândia is the neighborhood of Lapa, an enchanting district full of dilapidated architecture, colorful characters, and Samba filled bars. Yet amongst the grit, grime and sweat of Lapa’s bleeding heart comes a diamond in the rough – the steps. 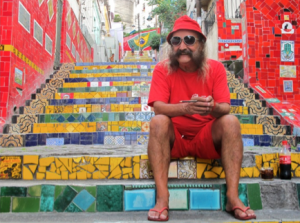 Selarón, the artist behind the famous stairs, smiles on the steps of Lapa, photo by Candy Pilar Godoy. Known as Escadaria Selarón (Selarón’s Staircase) the famous stairway is made up of 250 steps and measures 125 meters long. They connect the neighborhoods of Santa Teresa and Lapa, leading from Rua Joaquím Silva up to Rua Pinto Martins. Their splendor is not only due to size, but to décor; the steps are adorned in over 2,000 brightly colored tiles from more than sixty different countries. They have been featured in everything from Fanta commercials to the pages of National Geographic, with their international recognition growing to include appearances in music videos, documentaries, newspapers, and travel shows. Most recently they appeared in Rio’s poignant 2016 Olympic video bid “The Passion Unites Us”. Yet perhaps more interesting than the steps themselves is the history behind them. If you grace them you’re bound to see him – Jorge Selarón, the Chilean born artist behind the steps. If the stairs give off the aura of a magical realm, then Selarón is head wizard. Selarón at the steps of Lapa, photo by Candy Pilar Godoy. In 1990 Selarón began work on the decrepit stairway outside of his house. He had little money or food, and no experience with sculpture. “I had never done a sculpture. Not even a small one,” he said. And when will the steps of Lapa, his labor of love, finally finish? “’This crazy and unique dream will only end on the day of my death” says Selarón. I met him in november 2011 on the steps to offer him some tiles. It was a verry pleasant person. Have a good trip, Mister Selaron,. R.I.P. Not surprisingly, this wonderful artist’s brutal extermination is being deemed an official ‘suicide’ — though everyone with eyes and ears here in the neighborhood of Lapa knows better. I knew Jorge Selaron for over 20 years and I’ll tell you this: Selaron’s death was NOT a suicide. He was murdered, doused with a can of his own paint thinner, then set ablaze by one of the subhuman, drug-addled bottom-feeders of Lapa who had converted his visionary magnum opus into a noisome spawning ground for drug dealing, petty larceny and strong-arm muggings of curious tourists attracted to his artwork. To add insult to Selarón’s final, fatal betrayal by the city he loved, the local police here quickly covered up his murder, sweeping it right under the rug, despite many easy-to-follow clues leading to a host of obvious suspects. Such is life in Rio de Janeiro, City of God, in the Year of Our Lord, 2013. Some envious, pig lowlife incinerates a benevolent local icon alive with the flick of a Bic, in plain public view. Nobody sees anything, of course. Then, the governing powers of the city to which the victim dedicated his life simply turn their backs and spit on his memory in return, refusing to even investigate his murder – no doubt worried such a high-profile killing might leave another unsightly bloodstain on their lucrative international tourism racket. A shame and %$#! @&* disgrace!